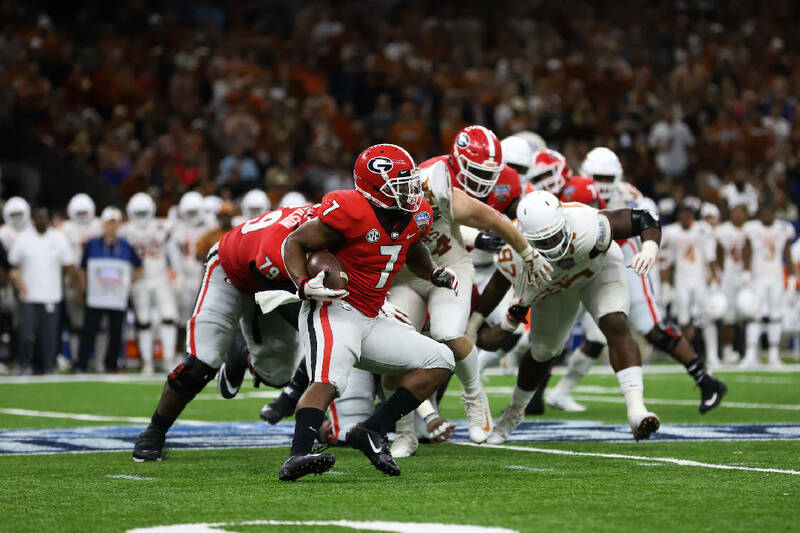 Georgia sophomore tailback D'Andre Swift, who had rushed for 1,037 yards and averaged 6.7 yards a carry this season entering the Sugar Bowl, was held to 12 yards on eight rushes during the Bulldogs' 28-21 loss to Texas on Tuesday night in New Orleans. The Georgia Bulldogs will be remembered more for their bark than their bite when it comes to the Sugar Bowl trip that capped their 2018 football season. When last Saturday's semifinal matchups in the College Football Playoff turned into runaways, multiple Georgia players posted on Twitter that the selection committee was wrong to exclude Georgia from the four-team field. Tuesday night provided an ample actions-speak-louder-than-words stage for the Bulldogs, who had a chance at a 12-win season and a No. 3 final ranking but were instead whipped 28-21 by Texas. "We said what we said, and we meant what we said," Georgia senior receiver Terry Godwin told reporters early Wednesday morning. "We just didn't come out and prove it." The Longhorns entered New Orleans with a 9-4 record, a No. 14 ranking and as double-digit underdogs, having succumbed in the regular season to Maryland, which went on to lose seven games, and Oklahoma State, which lost six. Texas was dominant from the start of the Sugar Bowl, however, holding the Bulldogs to 296 total yards, 72 rushing yards and just 2.4 yards per carry. Quarterback Sam Ehlinger completed 19 of 27 passes for 169 yards and had three rushing touchdowns for Texas, which led 17-0 early in the second quarter and 28-7 early in the fourth, and Bulldogs coach Kirby Smart was quick to make the outcome more about the Longhorns than what transpired on social media last weekend. "That would be an easy excuse to use," Smart said. "We had an opponent to play, and our team was focused and ready to play. In the world of social media, it's easy to say things. You didn't know what kids were thinking 15 or 20 years ago because they didn't have the ability to tweet it out or show it. Now, their thoughts change every 10 seconds. "Just because they tweet something emotional during that time, that doesn't matter. It gives the other team motivation, but our team was motivated to play Texas, and Texas outplayed us." Smart's message after the loss was not exactly echoed by his players. "I'm going to speak for my team and everybody — I feel like we had the big head and didn't come out focused," redshirt sophomore left guard Solomon Kindley told reporters. "We took Texas lightly." Junior tight end Isaac Nauta addressed Saturday's tirade on Twitter by saying, "We probably should have kept our mouths shut on that, but I still believe we're the better team and that they played better than us." The Bulldogs took an 11-1 record into last month's Southeastern Conference championship game and looked like the best team in college football midway through the third quarter, when they held a 28-14 lead against Alabama and had outgained the Crimson Tide at that point by 205 yards. Alabama rallied for the 35-28 victory, however, and Georgia players were asked for nearly a month if that loss would have a lingering effect. D'Andre Swift's fumble and a low snap that resulted in punter Jake Camarda's knee touching the ground for a 14-yard loss early in Tuesday's game added to the appearance of a hangover, but quarterback Jake Fromm insisted Alabama did not beat Georgia twice. "We flushed that game and went back to work," Fromm said. "We realized what had gotten us to this point, which was going to work, grinding and really going hard at practice. Leading up to this game, I thought we practiced really well and did a lot of good things. We just didn't play well today." Fromm said Georgia's returning players will turn the page from the bowl loss and "come back better than ever." Those Bulldogs who no longer have eligibility remaining hope a four-year perspective that included a coaching switch from Mark Richt to Smart can overshadow a disappointing four hours at the Mercedes-Benz Superdome. "Georgia's heading a different direction than it was a couple years back," senior defensive end Jonathan Ledbetter said. "I can say I was a part of the group that laid the foundation for that. Obviously, you see the standards changing, despite today, and the culture of Georgia has become something greater than it ever was. "I think it will continue to do that way beyond when I'm gone, but I was here for the start of it, and that's big for me. I'm grateful for that."